Written by: Rebecca Miller on October 16, 2018. Last week left the Doctor, Graham, Ryan, and Yaz floating in space, when the Doctor’s attempt to teleport to her TARDIS goes a bit awry. This week picks up right at that point with a ship appearing out of hyperspace and “scooping” Ryan and Graham into one ship and then a second ship “scoops” the Doctor and Yaz up. The ship Ryan and Graham are on is piloted by a woman named Angstrom, and the Doctor and Yaz on a ship called Cerebos piloted by Epzo. The groups reunite on the surface of the planet which has slipped out of its orbit and why all groups found themselves off course to start with. This sets them off on a crazy race, as the final leg of the Rally of the Twelve Galaxies across a dangerous planet, Desolation, to a disappearing and reappearing Ghost Monument, that just happens to look an awful lot like the TARDIS, for the prize of a ride off the planet and a boat load of money. A planet that has a deep, dark history, and brings the word inhospitable to a whole new level. This episode is a lot of The Great Race meets Ghost Hunters in a lot of ways with a smattering of Call of Duty and maybe even a little Doom thrown in. There are just so much going on and so little of a bread crumb trail to figure it out. For all that, the plot manages to pull all the pieces together and give us characters we actually find ourselves caring about. Angstrom, in just a few scenes and one short monologue, gives us a picture of the desperate situation of her family and her planet to have us rooting for her to win the race. Epzo, at the same time is obnoxious and endearing. Chibnall manages to flesh them out without sacrificing plot to do it. He also managed to hit the right notes with Doctor Who baddies. The Sniperbots and the sinister Remnants were just the right bit of creepy and scary. 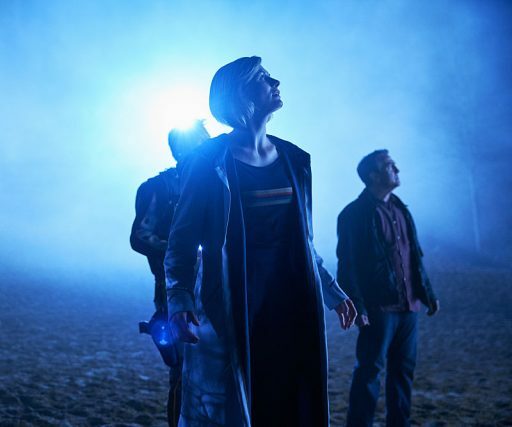 For as much worries that Chibnall would be tossing out all the history of Who to “reboot” with the new Doctor, there are some wonderful throwbacks to other Doctors in this episode and a few new twists on them. The Doctor uses Venusian aikido (one of my all time favorite things!) to paralyze Epzo for a moment to make a point without hurting him. We also get a look at the all new and updated TARDIS. She’s given herself an update and for the first time the Doctor say, “I like it!” as opposed to the usual response of “I don’t like it.” This is an interesting departure. Unlike the Doctor, not so enamored with it. It screams more Krypton than Gallifrey and way too busy, but the custard cream biscuit it gave her was nice. We also get treated to the new opening and new musical theme this week. These new titles are only the second time the title appears outside the time vortex and then sweeps inside. The first being the minisode Time. The CGI is beautiful and a bit psychedelic, like a kaleidoscope. The music has a good feel to it, if rather short compared to other title sequences. There is also a reference back to the Stenza. Angstrom mentions that her own world Albar has been subjugated by the Stenza and has sent the survivors into hiding. This starts to bring out our big bad for the season is going to be the Stenza. 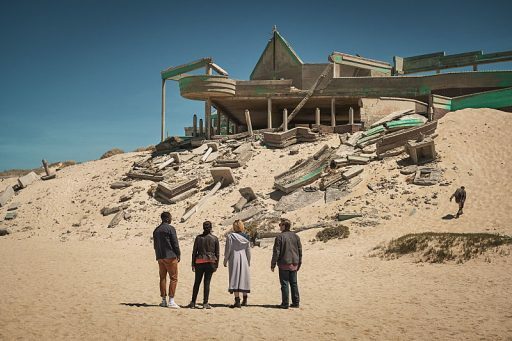 This series is getting off to a good start, and it will be interesting to see where Chibnall is going to take it. I am enjoying Whittaker, but she is a far more polite Doctor, than those in the past. That’s something that is going to take a bit to get use to. Next week will be interesting to see what they do with 1950’s America and Rosa Parks.